What better setting to enjoy a taste of the Yorkshire Dales than Simonstone Hall. Our Sunday Roast Menu is designed to showcase the very best flavours of the Yorkshire Dales – including our deliciously tender lamb from the Simonstone Farm. Our food couldn’t be more ‘local’. 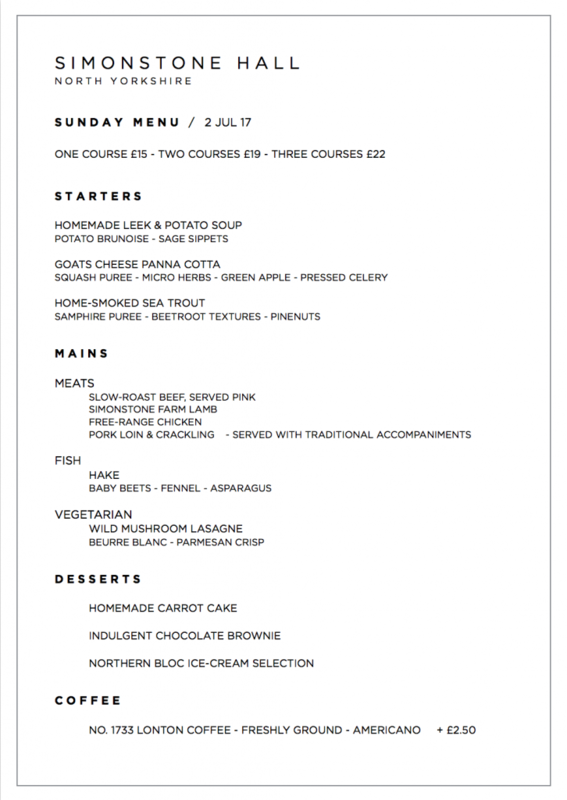 The Sunday Roast menu is available between 1pm and 8pm on Sunday and is perfectly suited to those looking to enjoy a hearty, relaxed lunch in this perfect setting. Our menus remain subject to change, in order to ensure that ingredients remain as fresh and seasonal as possible. Please contact us directly for any special requests or dietary requirements. Our Brasserie offers a casual eatery dining experience and boasts panoramic views across the Pennine Range and Dales. Open daily, seven days a week, it is the perfect setting to enjoy our extensive breakfast, lunch, afternoon tea and evening menus, composed of delicious treats and quality seasonal fayre, locally-sourced and freshly prepared in the Simonstone Hall Kitchens. We endeavour to cater for all special and dietary requirements, please contact a member of our team for further details. Enjoy beautifully satisfying food from the Simonstone Kitchens, showcasing the very best in local, seasonal and homegrown ingredients. Dine in our beautiful, panelled Drawing Room with superb original features and views across the valley. Enjoy an exclusive dinner in one of our impressive private dining rooms, seating from 2 to 22 guests, its a truly intimate experience you'll love!